Note: The following is a repost from the Whole9 Archives. Enjoy! In February 2011, Dallas wrote an article for Performance Menu, the “journal of nutrition and athletic excellence” published each month by Greg Everett of Catalyst Athletics. 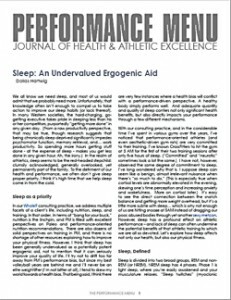 The article focused on the impact of sleep (or lack thereof) on your health and athletic performance. Here’s a preview from Dallas’ article. In the realm of athletics, sleep seems to be the red-headed stepchild: clumsily acknowledged, generally overlooked, yet permanently part of the family. To the detriment of our health and performance, we often don’t give sleep proper priority. I think it’s high time that we help sleep come in from the cold. You can download the full Performance Menu PDF here. And as you couldn’t comment or post questions on the original article in PMenu, we’ll host them here – so feel free to post your thoughts below. Enjoy – and tuck yourself in a little early tonight, okay? Thanks for this article, Dallas! Try reading Bringing Up BeBe by Pamela Druckerman. The French have no trouble getting their infants to ‘do their nights’ by a the second month, tops. When the baby cries, they hear it and listen to make sure the baby puts itself back to sleep, even if it’s crying. If the kid continues to carry on, then they’ll go in as see what’s wrong. They give their infants the chance to learn to put themselves back to sleep. Where American parents make the mistake is when they hear the baby cry and then go right in to see what’s wrong….and wind up really waking up the baby. So now he’s awake awake, and now he’s up for hours.